This Profibus PA line is used in the area of process automation, among other things in the chemical industry. 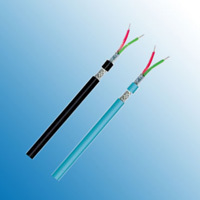 This cable is an economical solution for the cell and field area. For the information exchange between different automation systems as well as for communication with the connected decentralized field units, serial field bus systems are used. The types mentioned here are suitable for ex and not-ex installation and are equipped with a special PVC-jacket.